As the capital of the United States, Washington DC finds itself in a position to act as an example of the nation. With a lot of natural beauty to protect, Washington DC has a lot of potential to expand on their solar energy production. Solar power in Washington DC has been growing rapidly. Between new technology and favorable solar rebates, it’s never been a better time to consider solar energy in Washington DC. A typical 5/kW solar panel system in Washington DC can cost up to $25,000 dollars. This is typical for solar panel systems around the nation. While a huge investment, a solar panel system’s cost can be offset by rebates and tax credits and can help you save big on your energy bills. After applying the tax breaks incentives and rebates, you’ll be looking at around $12,500 for that 5KW system, and that is not only affordable, but also makes it a great investment. The above costs is only an estimate. each house and location is different, so to know your exact cosats and savings in your Washington DC home, is to talk to one of our trusted solar installers, and get an accurate quote. It’s 100% FREE. Within five years, many consumers find that their solar energy systems practically pay for themselves due to their energy output. Consumers also have the options to get the PV system with Zero Money down, through solar lease, solar loan, or even a solar PPA in certain situations. Please read explanations below about all financing options. This case study shows that despite the initial investment, solar energy systems can contribute to significant electricity bill savings. A team of students at the National Cathedral School in Washington DC raised over $20,000 dollars to build a PV system over National Cathedral School’s Hearst Hall. The system was found to help the school save about $1,103 on their electricity bill over a year and was able to help offset about 6.3 tons of carbon emissions, which is the equivalent of 162 trees. The 5.76 kW system produces about 588 kWh a month, helping the school become more self-sufficient when it comes to energy production. Many residents find that installing solar panel systems can help them do the same. Residents in Washington DC have a lot of excellent rebates and incentives to look forward to as they consider installing solar panels. Along with net metering and tax credits (which we’ll get into in a moment), residents can benefit from Washington DC’s district-wide solar rebate program. This rebate program allows you to benefit from earning $500 dollars for each kW installed, so a 5KW system will save you $2500 dollars. That’s a great way to offset the cost of installing a solar panel system. The rebate program is handed out on a first come, first serve basis every year, with the rebates being available until the yearly payout is exhausted so act fast when installing your solar system. Washington DC’s RPS (Renewable Portfolio Standard) is a legislation that calls for 20% of Utilities companies’ energy generation to be produced via renewable energy sources, such as solar power by 2020. It’s a great precedent for the nation. Washington DC’s solar carve out calls for 2.5% of Washington DC’s renewable energy to be produced by solar means by 2023. Much of this solar energy is to be produced by residential installations- utility companies have been called upon to meet the solar energy portfolio by purchasing solar energy from residential solar panels. While there are no city-specific tax credits available to residents in Washington DC, residents can benefit from the Federal solar tax credit. This allows solar panel system owners to claim a 30% tax credit on their solar panel system for any systems installed before or in 2016. If you would like to benefit from the Federal solar tax credit, act quickly. The Federal solar tax credit is expected to step down to 10% for future commercial solar panel installations, and to be eliminated completely for residential installation. There are strong suggestion that this awesome benefit will be extended, but why wait? Homeowners have still time to act now in DC and generate great savings. Residents in Washington DC can enjoy a 100% property tax exemption on any potential increase in property value that you may enjoy from installing a solar panel system. This is called having your cake and eating it too. Solar panel systems can add thousands of dollars in property value to your home. However, everyone’s situation is different. Talk to a team of solar panel system installers today to find out how much you could save. There is no sales tax exemption, meaning that unlike many districts and states, you’ll still need to pay a 5.75% sales tax on solar panel system purchases in Washington DC. But between tax credits and rebates, you’ll still be able to save quite a bit of money on installing your own solar panel system. Electricity rates in Washington DC usually go for about $.13/kwh. While this is around the national average, the cost of electricity in Washington DC manages to stay relatively cheap because of a heavy reliance on fossil fuels and fossil fuel company subsidizes. Due to the fossil fuel market and the fact that it’s a non-renewable source of energy, fossil fuel energy consumers are victims to the market’s rise and falls. Producing your own renewable energy allows you to become more self-sufficient and contribute towards saving the environment. Net metering is a great way for residents in Washington DC to help save or even earn money on their solar energy output. Net metering is a process that allows you to connect your solar panel system to the energy grid and measure your energy output. Any excessive power produced by your solar panel system goes back into the grid. In Washington DC, you can redeem this excessive energy through credits that you can use to reduce your electricity bill. These credits can roll over from month to month, used whenever you need them. Residents in Washington DC may also want to consider the SREC program. SREC stands for solar renewable energy credit. For every 1,000 kwh your solar panel system produces you’ll earn one SREC, which is sort of akin to a voucher. SRECS are sold and purchased on the open market. Energy companies are required, due to the RPS, to purchase SRECs. Considering the fact that there’s not a lot of solar energy output at this time, SRECs can be very profitable. As of right now, the average cost of a SREC is $500. If you have six SRECs, you can handily benefit from about $3000 annually, so long as the cost of a SREC remains consistent. To participate in the SREC program, have your solar panel system installation team register your panel with the DC Public Service Commission. On average, it takes the PSC 30 days to approve your application. Once you receive your PSC approval letter and paperwork in the mail, you’ll be able to register your system on the Generation Attribute Tracking System (or GATS). This allows your energy output to be monitored and your credits to add up. How do you sell your credits? You have a number of options. You can either sell the credits back to the energy company directly for immediate cash, sell your SRECs via a long-term contract, or sell your SRECs yourself on the open market. SRECs allow energy companies to purchase proof of production. 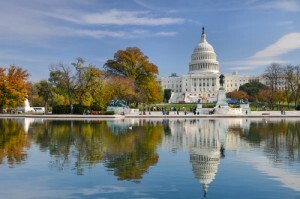 In Washington DC, residents can use both SRECs, which are considered simply proof of clean energy production, and net metering at the same time to help bring down their electricity bills. 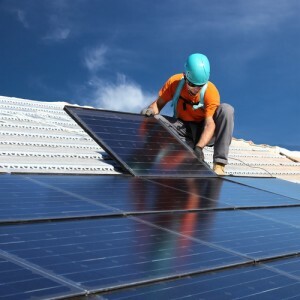 Along with tax credits and rebates, Washington DC does feature a number of financing options designed to help you save even more on your solar panel system installations, including solar leases and loans. Consider these options if you would like to avoid paying significant upfront fees when installing your solar panel system. Solar leases are a popular option for many solar panel system owners in DC (as well as many other states). Leasing a solar panel system allows you to benefit almost immediately from the output that your system generates for zero money down. You’ll need to make a monthly lease payment but it’s usually lower than your current electricity bill may be. You’ll be able to save money almost immediately on your solar panel system. However, you won’t be able to benefit from any potential rebates or tax credits. Still, you have the option of later purchasing the solar panel system once your lease is over and you’ll still be able to save a good chunk of change, all without significant upfront costs. A loan is another option you may want to consider as a DC resident, when installing a solar panel system. A solar loan allows you to obtain a panel system without posting your own upfront fees. Loan payments are usually consistent, allowing you to keep track of your solar panel payments easily. Unlike lease options, obtaining a solar loan allows you to still offset the cost through rebates and tax credits. It’s a great way to enjoy all the benefits of installing a solar panel system, including all the returns you may be making from your energy output, without worrying about losing out on rebates or having to post an upfront fee. If you have excellent credit, a solar loan may be an option you’ll want to look into. For some DC homeowners, a solar PPA can be a great option. By allowing a developer to install a solar panel system on a resident’s residence, a resident will be able to benefit from cheaper electricity from purchasing the output of the system. The resident, however, will not have to purchase the system or pay for any potential maintenance. This can be an excellent way to benefit from the power of solar energy panels without having to make any heavy investments. Keep in mind that because you don’t own the system you won’t be able to benefit from tax credits or rebates even if the system is installed on your own property. You will, however, get to benefit from any potential energy savings because you’ll be directly purchasing your electricity from the owner of the system or depending on the terms of the agreement. Thanks to generous rebates and plenty of financing options, solar energy in the nation’s capital is becoming a viable option for many residents. Between loans, leasing, and solar PPAs, almost anyone can benefit from a solar panel system. Solar energy allows residents to become less dependent on the energy grid and allows them to save significant amounts of money on their own energy bills. Within five years, most solar panel systems in Washington DC end up paying for themselves, making it a very cost effective way of producing your own renewable energy. Solar energy is a great way to do your part in helping to offset fossil fuel consumption and keep Washington DC green. With a fantastic RPS, Washington DC is on track to set a great example for the rest of the nation. If you’re interested in installing a solar panel system, get in touch with your local solar panel installer to see what they can do for you and what you can stand to gain.